From the trailhead the trail starts to follow the power lines till Golden Creek where the trail dips down steeply. Then the trail goes up Blueberry Hill and up past 24. Ten the trail flattens up and then goes up and past Mt Ararat High School. 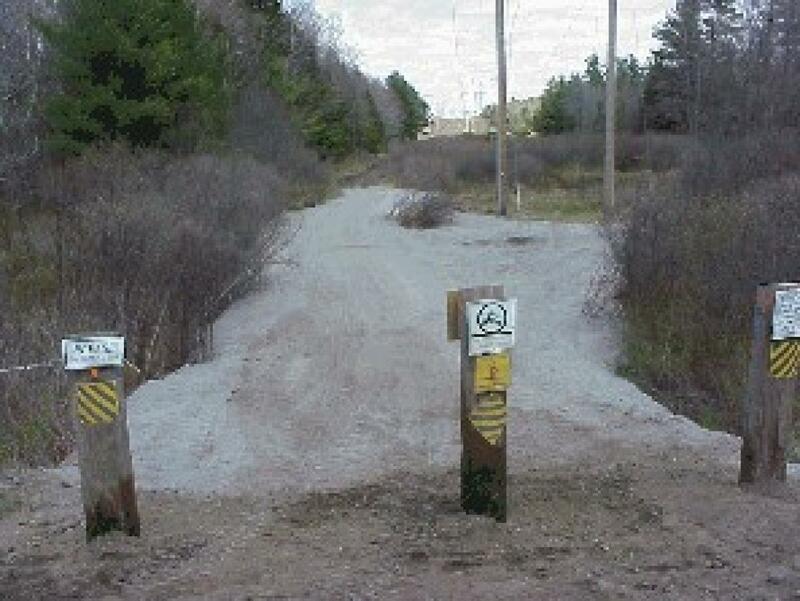 Then the trail follows 201 till the road crosses the highway then bear right onto the old entrance ramp. After several feet an old trail spurs off on the right. This trail is closed to motorized vehicles. This trail can also get quite muddy in the spring and early summer. The trail then goes and joins up with the power lines again. Then it connects in with the local gas station where another parking lot is located. The trail goes back into the woods circles around and comes into another power line corridor. The trail then crosses over state route 196 and follows a stream for a short while. It then crosses over 196 and enters the backwoods of western Topsham. The trail connects in with the power lines again and for several miles follows them. Then the trail goes into the woods again and eventually past an open area with an old camper. Then the trail joins in for the last time with the CMP corridor and then the trail intersects with Old Merrill Road. The trail goes up the hill and bisects between two trails. The trail on the right connect back with Ward Road where the road goes east to downtown Topsham where someone could be picked up in a one way hike. If you take the trail on the left you will follow the trail for another mile then curves off into the woods. The trail the comes next to a field and bears left onto Ward Road. This dirt road goes for several hundred feet and crosses the Little River, then the trail ends on a road called Edgecomb Road in the town of Lisbon. Review: Great Trail super fun and long with some challenging technical sections, a few steep downhills, and some fun stream crossings. Cross Topsham Trail MTB Trail 4.00 out of 5 based on 1 ratings. 1 user reviews.